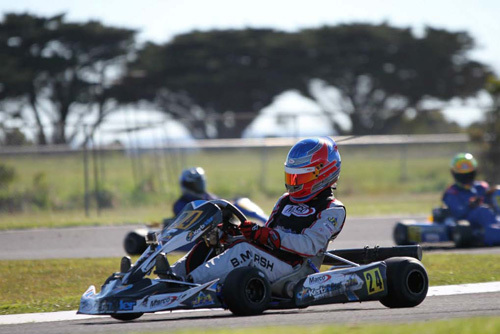 The Portland and District Karting Club hosted Round 5 of the 2014 Austrans Victorian Country Series on September the 7th with over 110 entries received. The weather was fine and sunny for both days which allowed drivers plenty of good running on Saturday to give them the best setup come racing on Sunday. The meeting finished nice and early which gave drivers and crew plenty of time to make the long haul home. There seemed to be some uncertainty leading up to the meeting if the Series would be going ahead in 2015 due to KA’s Whole of Sport Review. To clear any uncertainty up, I can confirm that the Series will definitely be going ahead in 2015. All the clubs are on board, so keep an eye out later in the year for more info about the 2015 Series. Above: Bradley Marsh-Stepney took the win in the Colin DeVries Memorial for Clubman Light. The first class to hit the track for the days racing was Rookies. Jack Hutchins had a dominant run for the day as he took out the win from Nikki Watson who showed strong consistency to take the runner up spot. Jaxson Cox rounded out the top three. 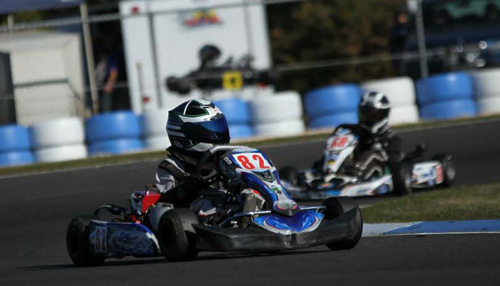 In Junior Clubman Domenic Romeo took a clean sweep of wins for the day. Nicholas Caroll recovered from a first corner DNF in heat 2 to finish in second for the day ahead of a consistent Lachlan Fitchett. Kyle Rethus put in a strong performance in a competitive field of TAG Light to take the win. As per the previous class it was a close battle for second. This time it was between Ashley Lear and Maverick Benson with Lear coming out on top. In the Colin DeVries Memorial for Clubman Light it looked as though Kyle Rethus may take out his second win for the day. Bradley Marsh-Stepney had other ideas and crossed the line first ahead of Rethus. Local Mathew Keiller continued to feature in the results of the Memorial race with third place. Junior National Heavy saw Nicholas Caroll and Brayden Flood take a comfortable 1-2. The battle for third however was closer with four drivers battling during the day. In the end it was Kirby Hillyer who came out on top with third place. Anthony Warner once again had a strong round by taking the win in Sportsman Restricted Heavy. A consistent run through the day saw Barry Clough finish in second place with Taylor Gore rounding out the top three. Once again it was the Cadet class who put on the most exciting and spectacular racing. Matthew Domaschenz and Kai Allen put on a great race at the front with Allen just getting over the line for first from Domaschenz. However Corbin Bailey would put in arguably drive of the day when he end for ended his kart in the roll around laps of the final. Bailey then took up his starting spot of 5th and then drove to the final podium position. As has been the case in Clubman Heavy for the Series it has been Chris Thomas out in front. This round would be no different with Oakleigh driver taking 3 wins from 3 starts. A good fight for second was fought out between Heath Jelbart and John Dankowski with the latter getting the upper hand at the chequered flag. In TAG 125 Heavy Corey McCullagh and Scott King both split the heat wins. At the end of the final it was McCullagh who took the win from King in second with Daniel Rethus rounding out the top three. Sportsman Restricted Light had a strong field of 17 face the starter. Mitchell Mackay took a comfortable win from Jake Hose who had a further gap back to the battle for third. That battle consisted of Brock Rae and Megan Vallance who had an exciting last couple of laps with Vallance coming home in third. Sportsman Restricted Super Heavy saw Billy Askew grab another good series haul of points with second place; however it was Andrew Hayes who took the win after suffering a heat DNF when he dropped a chain. Frank Ferraro again showed his consistent for with third place. A good field of Junior National Light met the starter with National Champion Dylan Hollis taking the round win over Jordan Rae in second. The battle for third was close with Shane Moreland just beating home Jordan Pianezzola for the final podium place. A solid round from Leon Forrest saw him take a comfortable win in Clubman Over 40’s. Andrew Stubbs came home in second position with Mark Rogers edging out Ron Taylor for the final podium spot.